July 20-21, 2013 Weather Summary, Environment Canada, with added material from EWR. The following is the EC summary of weather events over the stormy past weekend of Friday, July 19, 2013 and Saturday, July 20, 2013. EWR adds some of our graphics and info from our own monitoring activities below the summary. At 10:46 AM EDT Monday 22 July 2013.
was affected, from Windsor to Ottawa and from Lake Erie to North Bay. 2 minor injuries were reported in Chatham late Friday evening when a tree fell on a car with the people in it. damage in Ontario was caused by straight-line, downburst winds. Environment Canada has received as of 7:00 PM Sunday. Winds estimated at 150 km/hr. EWR’s rain gauge measured 35mm of rain by the completion of the frontal passage Saturday morning. 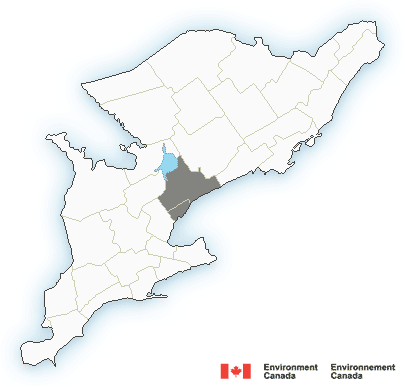 In the radar animation below, covering the time from 7:28 pm Friday to 9:01 am Saturday morning, two storm systems collided over the Niagara Escarpment at Grimsby at approximately 9:10PM Friday evening (early part of the animation). 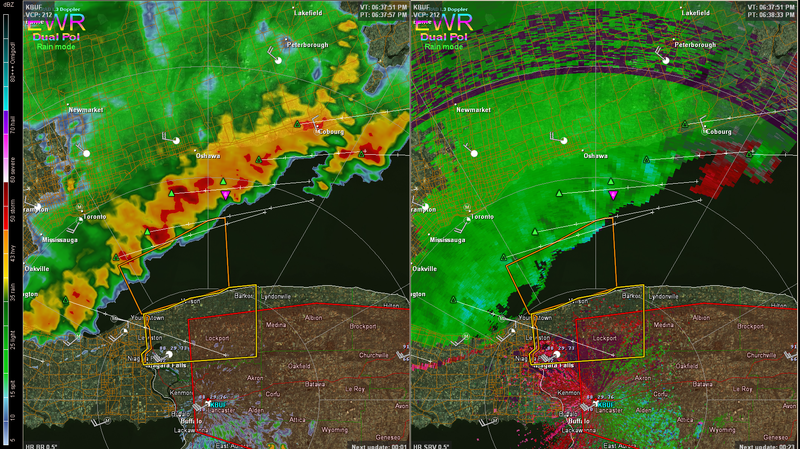 The westernmost system advanced eastward along the north shore of Lake Erie from the St. Thomas area, and colliding with the system moving southerly across the GH-GTA from the Kitchener-Waterloo area. The Lake Erie system was strongly electified, and the light show was impressive. The gust front from that system was strong with torrential rain in wind as it passed over Dundas, Ancaster and Hamilton. The bulk of the rain we measured at EWR came from that gust front. Click image to start animation if it doesn’t start on its own. This Storm Relative Velocity* image, taken at 6:20pm on Friday, shows two areas of rotational development along the gust front of the storm line that had just arrived from the Kit-Wat area. The inverted pink triangle is a “TVS signature” sent out by the KBUF radar system, indicating conditions for tornadic rotation exist. Immediately to the right of the TVS signature is a very tight “couplet” – bright red and green, indicating that rotational winds exist. 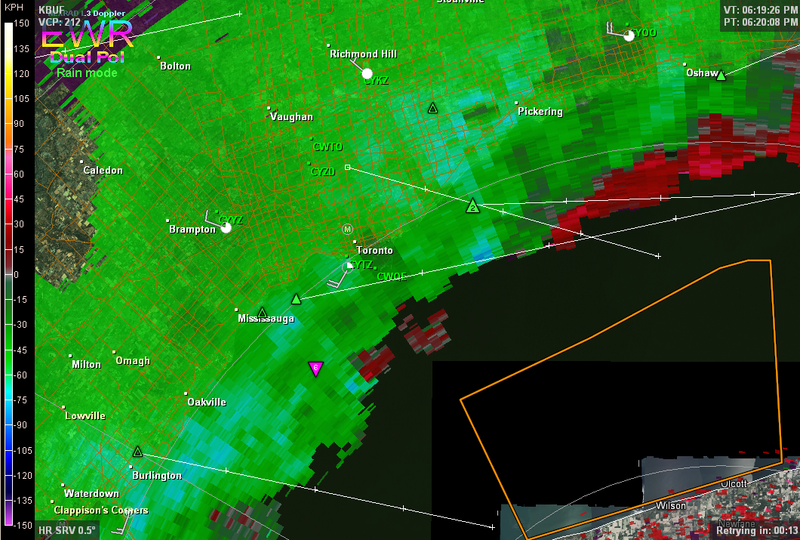 The beam centre at this distance from the Buffalo station is about 4300 feet, so it is unknown if this rotation yielded a waterspout or not (its over Lake Ontario at this point). South of Cobourg, another area of suspected rotational development – quite a large area, suggesting the storm cell is developing a rotating core. The bright green is suggestive of a strong in-flow jet. When this storm passed over Dundas, there was a strong “fresh earth” smell to the storm leading edge, and a bit of “greenness” to the advancing shelf. Both are suggestive that there had been tornadic activity in the cell in its travels, or at least very strong updraft over open land. * Storm Relative Velocity – a radar measure of the direction and intensity of winds in a storm, relative to the wind velocity over ground of the storm. Visualizes the wind within a storm, as opposed to the wind we feel over ground. 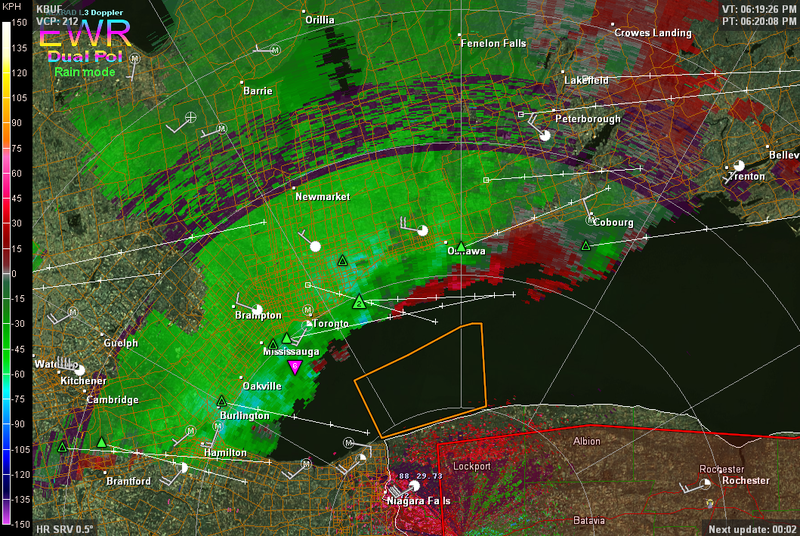 Green – winds flowing toward the radar station, red, flowing away. To be tornadic the couplet must straddle a radial – a line drawn from the radar site to a couplet. This image is a zoom-in of the previous one, to get a better look at the couplet. Key elements are the tight and intense colour change. This is indicative of very tight rotation, consistent with a small but well defined funnel, tornado or waterspout. A combined Storm Relative Velocity (right) and Base Reflectivity view of the previous area, approximately 20 minutes later. The storm line has moved further across the lake. The previous couplet has dissipated, and a new TVS has come up, although there isn’t any overt indication in the SRV pattern to indicate a cell. These views only represent one angle sweep – the lowest tilt – there may have been more evidence in higher tilts. The Coboug pattern is better defined and is most likely a strong inflow jet. This is borne out by the shape of the cell in the Base Reflectivity scan. This is a tornadic supercell in the making, but it didn’t mature much beyond this phase. 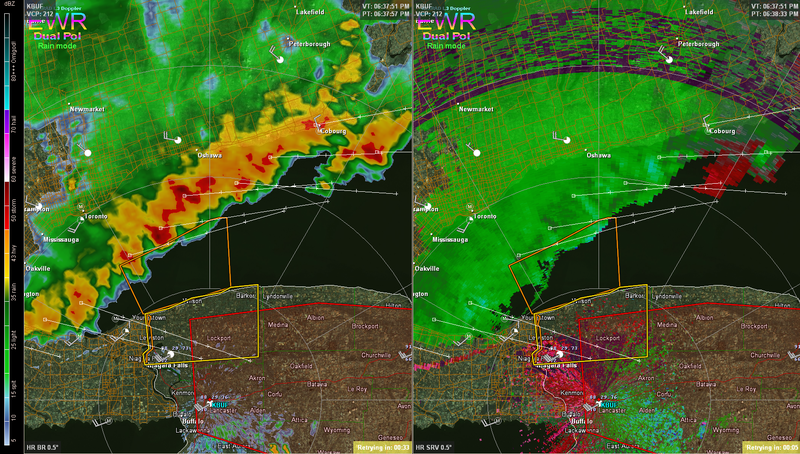 Of interest, is the well defined “gust front” shelf or roll cloud formed ahead of the storm over Niagara. Notice the thin cloud line in the base reflectivity scan, and the thin green and red line in the SRV scan, stretching from Youngstown in a gentle arc eastward out of the frame, just ahead of the main cloud mass. This image is the same as the previous scan, just one radar cycle later. The TVS icon has dropped, but the Cobourg cell is maintaining its integrity.